Few could have predicted the huge success that greeted the return of German Metal masters Accept, the veteran genre leaders riding the crest of a wave since their 2010 comeback album 'Blood Of Nations'. With their most recent release, 'Blind Rage', reaching the top of the charts in their homeland – the band's first to gain that honour – and a stunning live bluray/DVD/CD release set to start 2017 in impressive style, guitarist Wolf Hoffman settles down with Fireworks to give an honest and open account of his band's many years and counting. "There are some things in Accept that have never changed, even since I joined the band when I was 16 years old, and that format is the foundation of everything regarding Accept," Wolf begins, candidly assessing why his band are having greater success than ever since their 2010 resurrection. "Without a song you don't have much, no matter who is performing it. It is pretty obvious that we as artists need to be bold and sometimes take risks. Sometimes you lose your way and other times you find your core. I believe there is a special chemistry between us that has, in its various forms, survived all winds and weathers coming our way!" However it's the awareness the guitarist shows towards his fans' desires that maybe explains that phenomenon best. "Diversity without change is probably the hardest thing," he continues. "We have certain cornerstones we want to hold on to. If you follow our songwriting it is easy to see what we are trying to do." With the band parting for a second time with singer Udo Dirkschneider nearly twenty years ago (barring a brief get together in 2005) and the memory of a failed, if misunderstood and under appreciated attempt to replace him the first time around, it's little surprise that Wolf is honest enough to admit he and his band mates were surprised by just how enthusiastically their third singer, Mark Tornillo, has been welcomed into the fold. "Of course!" He says with a mixture of shock and pride, "we were floored. None of us expected that. We hoped for it, but the chances were really slim... and yet it happened." Although in the founder member's assessment, the reasons couldn't be more obvious. "His voice and our music is just a perfect match, it is that simple and the fans – old ones and new ones – get it. We just look at each other and say: 'MISSION ACCOMPLISHED'. It fits like a glove and we grew as a team with Andy Sneap, who has a very clear vision of us, and who pretty much operates on our wavelength all of the time. To have a producer working with us for so long now [since 'Blood Of Nations'], is a pretty sure sign that we are walking side by side with one goal in front of us; to be better each time than the last. According to the record sales and publicity, online presence and touring, I feel very confident that we are doing something right!" Something that was proved by that #1 spot in the German album charts for 'Blind Rage'. One can only presume it was a proud moment for Accept? "Yes, heavenly and very, very rewarding!" Wolf confirms. "We were the last ones to believe that it was true – but it is and we enjoyed every minute of it. We have always felt that the next album has got to be more challenging than the last one... sometimes that works and sometimes perhaps it doesn't. There is an urgency in me, which is always pushing and pushing. I am lucky because Peter [Baltes, the bassist who has been with Wolf in Accept since 1976] is right there with me. Our waves, as always, are similar, crashing at the same time and waning at the same time." Although surely this turn of events was unthinkable after the band's 2005 reformation floundered after a string of well received festival shows failed to go any further? "'Slipping away' has never crossed our minds," Wolf says, before further justifying that comment with a slice of realism. "The long break we had showed us just how fast things can change and life shattering events occur. I guess it is more our addiction to the sea of happy faces, to hearing the fans singing along. We can't let that go and we can't be without it for long. It took us a while to admit it... we NEED our fix... every night, everywhere." Although with the departure in recent times of two men who have helped make the band's resurgence so complete, it's not an addiction Herman Frank or Stefan Schwarzmann will continue to share. "If you look at our situation in 2010, it is easy to understand," Wolf says, explaining the exit of the guitarist and drummer. "All of us had a career going prior to reforming and none of us had a clue if we would be doing more than one album and one tour...ever! So we were looking for musicians who have their own career, their own life and interests. From the beginning it was agreed that everybody would be staying with Accept ONLY as long as they wanted to, and that we would all be supportive if they wanted to return to their own path. It was good for them to be with us, we took them around the world, several times, but they are ambitious and talented musicians who have had their own dreams for decades. When Panzer came along the opportunity was there and we supported them from the get go. Anybody who knows Accept knows who the heart of Accept has been, and due to all of the reasons that I have mentioned and some more, it made it pretty natural that one day they would leave. The fact that we live in America and they live in Germany has not really helped... not in the 80s, 90s or 2000s," he adds also alluding to previous inter-band issues over the years. So what of the new blood of nations in the band, drummer Christopher Williams and Grave Digger and Rebellion guitarist Uwe Lulis? "Nashville is full of talent," Wolf enthuses, detailing how the band teamed up with American drummer, Williams, "more than anywhere else on the planet, but Metal drummers are hard to find among them. We knew him for a while and he totally surprised us, and maybe himself as well, because there was not much 'testing' or 'growing together', no time wasted. Just like with Mark, it happened and it is hard to recall... have we not always been together? No? Really? Ok... let's go!" But surely it was more difficult than that for Wolf to click in so tightly with a new guitar partner? It would appear not! "How quickly it's come together could almost be seen as a sheer accident, nothing that we could have foreseen. He grabbed a guitar and followed my playing. 'Darn, Uwe', I said, 'you FIT! Let's try it.'" So does that instant chemistry mean Wolf's new six-string partner will become part of the legendary Hoffman/Baltes writing team? "Look," the guitarist says warily, "every musician is bringing something to the table and we've found a formula that works so very well for us, for over three decades. Never change a winning team, right? We have a great situation right now, everybody has found their place and their purpose in Accept and is fully embracing it. There are many levels of involvement and the most important is that it works for us! And it does!" If any proof was needed that Wolf's assertions are correct, then the band's forthcoming live blu-ray/DVD-CD release,'Restless & Live' undoubtedly provides it, although even he was surprised at just how well this superb release has come together. "We are amazed at how the band comes across. It is proof that the chemistry of five people, who come together to Rock, is something that one can feel, touch and hear!" However, even with that chemistry it's worth highlighting just how impressive Mark Tornillo is on stage, absolutely owning the early Accept tracks with the same conviction he delivers the songs he had a hand in creating. "I could not agree more," Wolf confirms, clearly impressed by his bandmate. "He has his own way of reaching out to the audience and making them very comfortable, and his voice is just right. No secrets...it just works." And that the new and old songs come together to make such a killer set isn't something the expert songwriter feels is surprise. "How I see it is that there are two situations; in a studio and on the stage, and they are not the same. Accept has mostly been able to spark a fire on stage, something made easier if you have songs which sound familiar and are easy to sing along with. We have some typically Accept style elements that we groom and cherish and want to keep, because it feels right... and when it feels right, then it is!" 'Restless & Live' beautifully captures the intense majesty of Accept's 2015 headline show at Bang Your Head festival. However with the visual and aural document not due to hit the shelves until early in 2017, it begs the question why it's taken so long for the band to let their worldwide fans experience this awesome show? "Oh, that was a chain of unintended circumstances," Wolf says honestly. "First was that we were very busy when diving in to it and second, we needed a bit of convincing to finally release it." Something that when you witness 'Restless & Live' is hard to understand. "Actually, we have to thank the director and editor Bernard Baran for that, he made us look at the first edited song. 'Not bad' was our first reaction, and then we realised it had been only the fourth or fifth show with Christopher and Uwe! Bernard was right, that was pretty cool. He would not give up trying to convince us... this baby had to be pushed out!" Especially when Wolf explains just how much of a thrill it was closing the show at their homeland festival. "We loved it and talk about a high, when fans are singing your songs, that is a major high!" When asked for his final thoughts on 'Restless & Live' Wolf again defers to the real people behind Accept, the fans. "We are pretty happy with it despite the fact that I am a terribly critical person. I always find something about my performance... mostly. But, I like to leave the verdict to our fans. They know better than we do where we stand with 'Restless & Live'." As is so often the case for band members who have parted ways, as one releases an album, so the other seems to do likewise. In this case the coincidence goes a little further, the band's original frontman, Udo Dirkschneider having just released 'Live - Back To The Roots', a live release showcasing twenty five Accept tracks sung by the long departed original voice of the band. For the first time Wolf isn't quite so keen to take up the subject... "We do not talk about other artists," he says firmly. "The only thing we care is about our performance, our releases and our fans. There is always someone who is releasing whatever, whenever.... you can't avoid this. As I've mentioned so many times, we are where we want to be musically and performance wise and that is all we could hope for and all we can achieve. We are enjoying the best phase ever in the band and seem to be doing better with every album that we release, which has been our goal from 2010 onwards." As if the opportunity to experience the live prowess of Accept in the comfort of your own home wasn't enough, the band will also be hitting the road in Europe with Sabaton and Twilight Force from January 6th, with dates in the UK around the middle of that month. It must be something the band are looking forward to? "Very much," the guitarists states, much more enthusiastic about this topic for discussion. "First of all we wanted to do our part to support a band which is a poster child of how to conduct business. Sabaton have an amazing organisation and of course, they have, like we all have, fans who love them and others who don't, which is very normal. But what is not normal is the way they conduct their business, their involvement in their career is exemplary. We just want to shine a little light on that fact. Secondly, we have not been on tour for a while, which is very un-cool for us. We cannot wait to get back on the road. The Sabaton tour gives us a great platform where everything is already there. We just want to rock, 60 minutes rocking our socks off... then, getting ready for an album release in 2017, followed by touring ... extended touring! We do the Sabaton tour for fun... and we expect a lot of fun! After that, our machine is still oiled and ready for the next level of the Accept craze!" So does that mean the next studio album is imminent? As Fireworks ends its time with Wolf Hoffmann, for the first time the Accept legend is ever so slightly coy in his answer... "This is the best kept secret! In due time we will make an announcement, but we need all our fans to cross their fingers, because 'Blind Rage' is a tough act to follow." 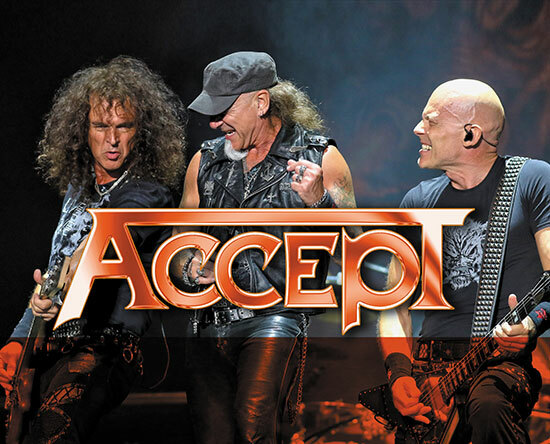 Accept's brand new DVD/live album 'Restless And Live' will be released on 13th January via Nuclear Blast. They will be touring the UK and Ireland in January 2017. They are currently working on new material.